This week we took the plaques we'd first set down in 1998 to celebrate the 25th Anniversary of the French Frigate Shoals Sea Turtle Tagging program and had them encased in plastic. They had stood up well all this time but we now felt they needed some protection. After all, this is their seventh underwater year. We're not kidding ourselves. 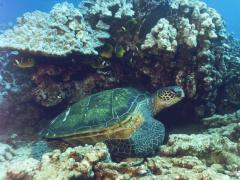 We know we have a bigger Past with the honu than a Future. 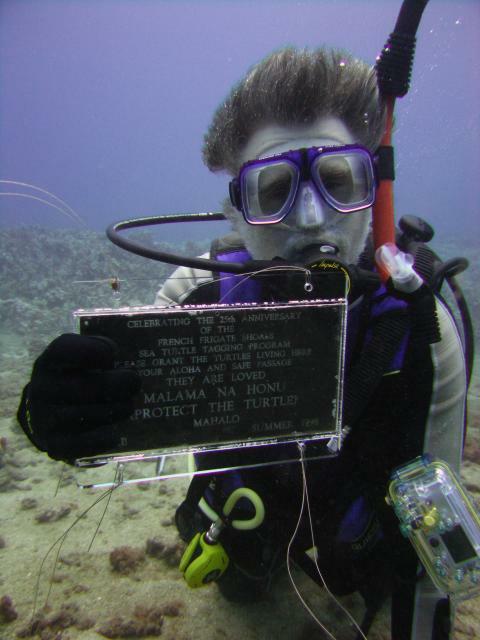 We did our very best to tie up the first plaque with the hope of Permanence--even though our experience here with the Honokowai honu has proven Permanence simply Isn't. Also, we did our best to tie the plaque firmly. Now we have to figure out where to place the second plaque. It used to be at The Gateway--the "entrance" to the Turtle House. Only now there's no Turtle House. Little incentive to fight the currents to go out there. No reason in the world we should feel compelled to put it back in that place. Perhaps, relocate it to Kuamo'o? 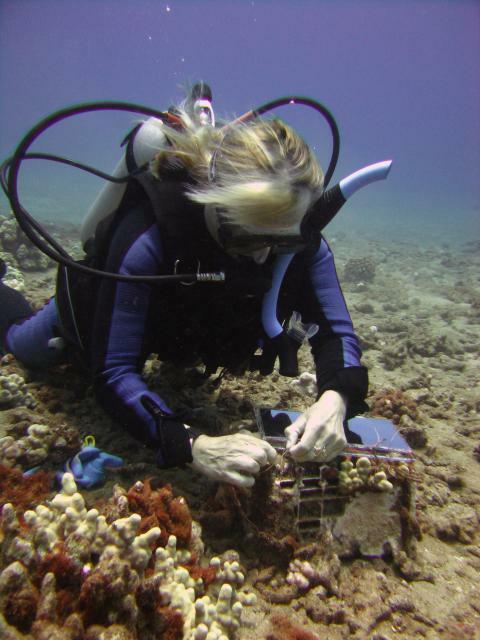 "The greatest adjustment we had to make underwater was getting used to the total absence of the Cladophora that has plagued our dive site since 1998. Every year it's been a blight reaching its peak nuisance level last summer. Now there's none. Good riddance!" 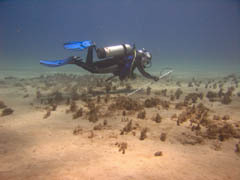 With the exception of a token effort by Hypnea musciformis to re-establish itself, these arid conditions have continued. 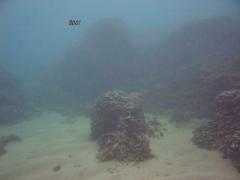 "Vast areas of our dive site are conspicuous in their lack of algae. Underwater it feels like a topsy-turvy world, where the algae turtles want aren't, and the wrong algae is growing in the wrong places." As well, there's so much sand! 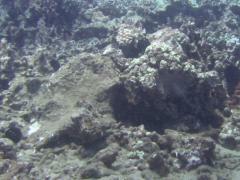 This year sand covers much of the shallows and the rocks and rubble that used to provide anchorage for seaweed growth. So here we are. Two people who used to complain to officials about the nuisance West Maui algae blooms now experiencing a scarcity the likes of which we've never seen. Back in 2002, we wrote an email to George Balazs first commenting on the surprising change to the seaweed presence at our dive site. ...Honokowai was essentially a desert this summer. So little limu. And if WE were a desert (arid), what must other parts of Maui have been like? What do turtles do? Stay and make do with the little limu they have? Or shift to places like Honokowai where there's more? Well, if the trend this summer keeps up, we'll have to conclude that one of the things they do is go somewhere else. We're seeing a lot fewer turtles this summer. As if seaweed decline isn't enough, we've already written about the complete disappearance of two major scratchposts during the 2004 large winter waves. Mt. Balazs, which could be counted on to shelter as many as six turtles at a time, simply vanished. So did a secondary resting post, K17 Rock. Add to that the complete absence of turtles at North House since Summer 2004 (Mt. 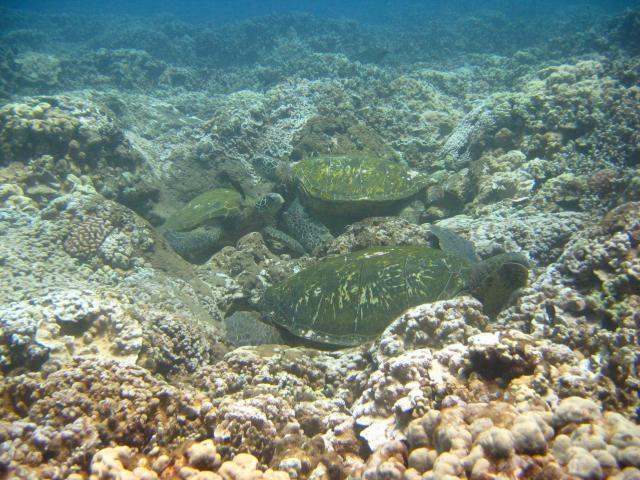 Balazs was a major honu attraction for this area) and it's no wonder we're down turtles. This in a stark contrast to the Kuamo'o site which still maintains a large aggregation of turtles. Then again, Kuamo'o also still has plenty of algae and seaweeds about. 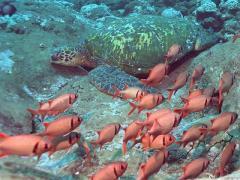 The fewer turtles in itself is a puzzle--but there are also far fewer fish! Schools of fish that have been there since the late 80's... aren't. Our greatest loss is a massive school of goatfish that first helped us find the Turtle House back in 1989. Every summer, this school shimmered in and around The Rock. There is no trace of the goatfish any more. Hundreds. No trace. The only area that still hosts honu in anything close to its usual numbers is the Reef 2 complex--and even Reef 2 is trashed. East House, once Reef 2's primary honu attraction and scratchpost, is no more. Remains of East House, 2005. Trust us. Almost everything wiped out or pummelled into rubble. Underwater Ghost Towns. 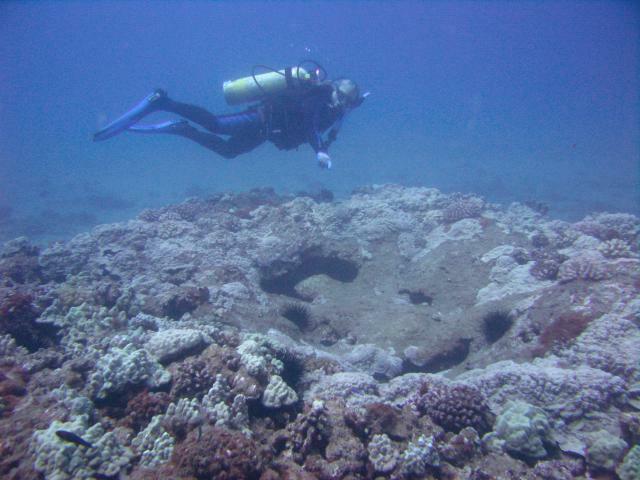 Our Honokowai dive site, which used to claim a fibropapilloma rate of 90%, is now a Fibropapilloma Bright Spot. 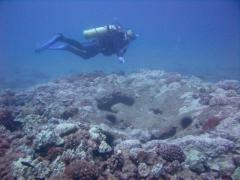 Someone diving here on any typical day would be hard-pressed to find a tumor case. The vast majority of honu, if they have lumps at all, are confirmed regression cases. All great news. 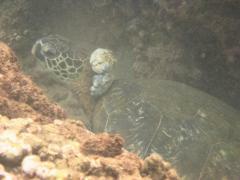 The good news is that there are still plenty of turtles at Kuamo'o. Turtles swimming. Turtles hovering. Turtles resting in sand. Turtles tucked into holes. Lots to keep our cameras busy. The bad news is that fibropapilloma is everywhere at Kuamo'o. 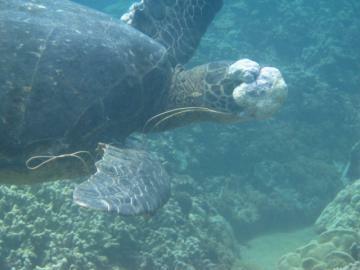 Most of the honu eyes looking back at us are marred by tumors. Far too many turtles are advanced cases burdened with large tumors, like those that dominated our dive site ten years ago. We are at a loss to explain the difference. Yet if we had an answer to that question, we'd be a long way to understanding the etiology of this disease. We have hunches--dare we even call it a Theory? This is our third summer diving at Kuamo'o. 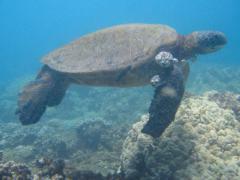 Already we know that some honu are resident to the area. We know that FP has progressed in several turtles. Yet we also have signs that regression is taking hold at Kuamo'o as well. Here are two Kuamo'o examples. 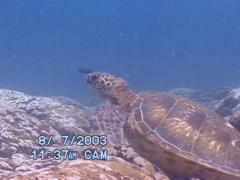 The first Kuamo'o turtle sighted for 2005 was originally recorded there in 2003. In the course of three summers, the turtle now is "FP-progressive." 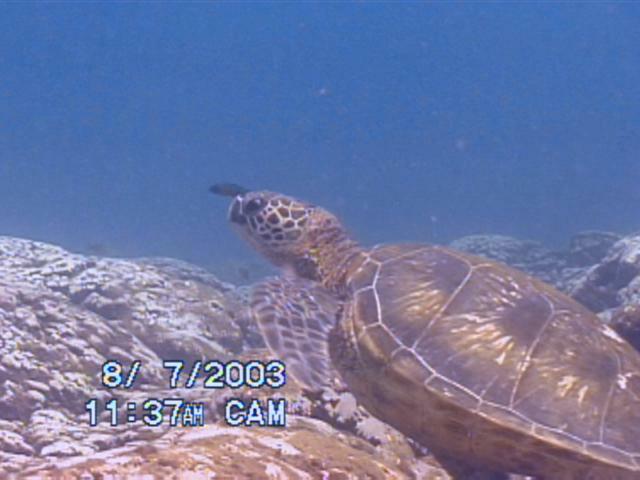 The first turtle we ever recorded at Kuamo'o, 2003 Turtle 169. You can see the first hint of FP in the posterio corner of the eye. We also see signs of good news, however. We resighted K367 this week. Her tumors showed subtle signs of regression. The right eye tumor especially was much smaller. While body tumors were roughly the same size as 2004, the good news there was that none were bigger! The texture of the tumors suggests to us that these growths are no longer hot. Partly because of this, but more importantly because the eye tumors are improving, we've now listed K367 as "regression suspected." Whether Kuamo'o's honu will follow the same FP path as the Honokowai honu,we can't say, but there's no reason to think that they won't. To answer that question, we'll need to dive there another five years. We're not sure we have that kind of spit any more. Some of us question our courage. At the best of times, visibility at Kuamo'o can be described as "not as bad as usual". In short, Kuamo'o gives Ursula the creeps. When the sun ducks behind clouds, the Creep Factor creeps up three notches. All-in-all, Kuamo'o attracts us more than Honokowai does. 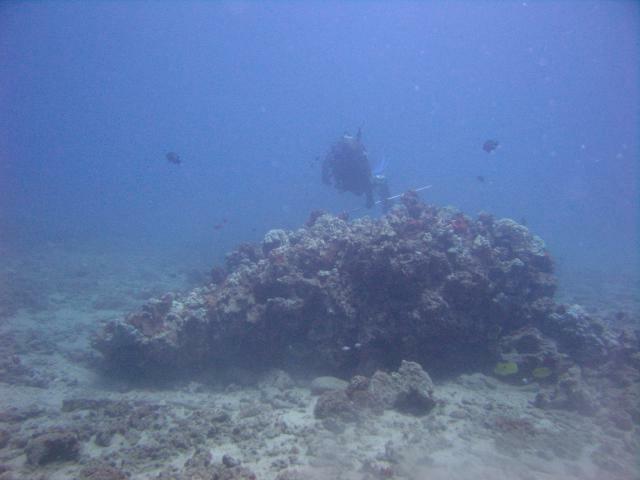 Now that there's a near absence of fibropapilloma at our dive site, there's no opportunity to learn about the disease to the degree that we can at Kuamo'o. Fact is, we find diving boring. Photos merely for photos' sake. Looking at turtles looking at us for looking's sake. Pretty diving just doesn't cut it for us. Since 1989, we've entered the water intent on answering questions. Those questions remain. So does The Enemy. 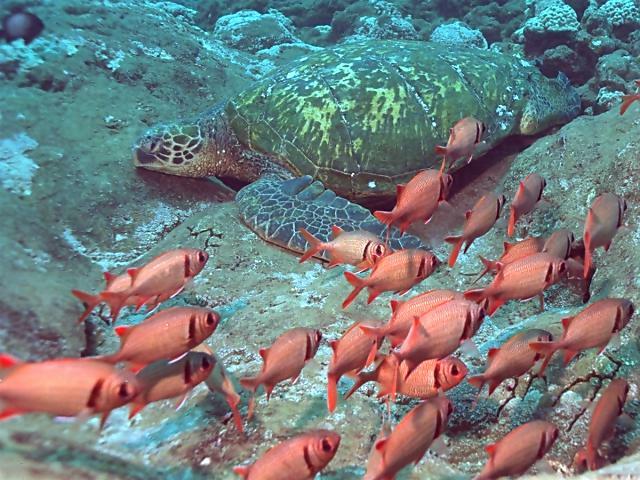 We've finally concluded that it's not just turtles that entices us to visit Hawaii, lures us into the ocean each day. It's taken--what is it now?--17 summers for us to realize, It's About Fibropapilloma. 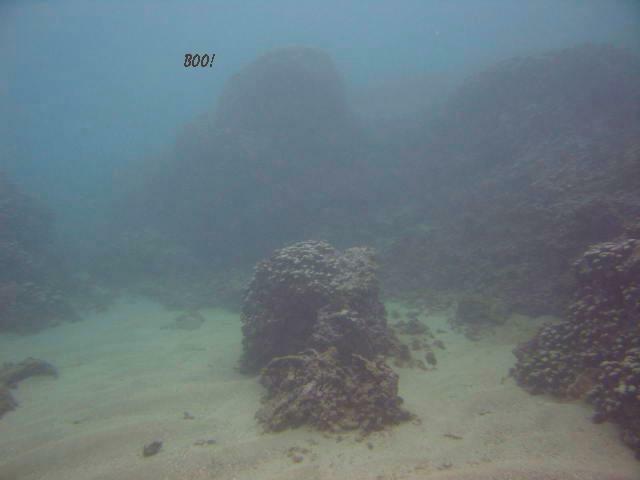 While the epidemic seems to have played itself out at our Honokowai dive site, the old burning questions about the disease remain as strong as ever. We can't let go of them. So it seems that we might have to shift our focus over to Kuamo'o if we ever hope to zero in on The Answer. FP and its misery. We just can't let it drop!